The Denver Nuggets brass is facing one giant fork in the road. Which route they take could dictate the franchise’s future for the next decade, but one can make a compelling case for trudging down either path. Kyrie Irving, the Cleveland Cavaliers’ All-Star point guard, is available via trade. Denver has the assets (and then some) to get a deal done. Whether or not they pull the trigger is one of the more intriguing developments in recent Nuggets history. While running an NBA franchise would be a pretty cool gig, I do not envy president of basketball operations Tim Connelly at the moment. This is a brutally tough decision. 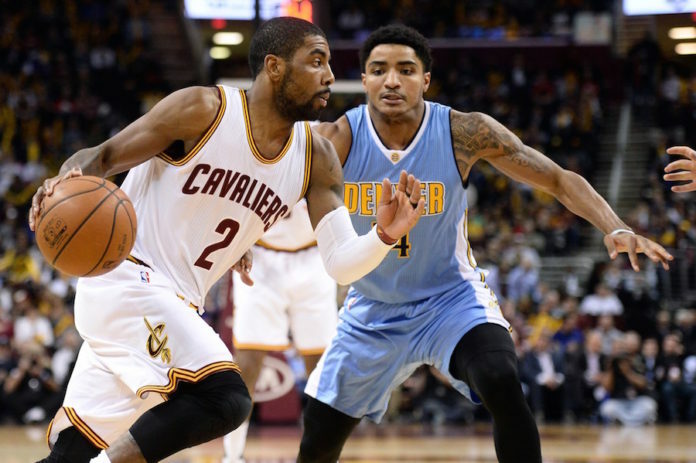 Bovada, an offshore sportsbook, has the Nuggets at 9-1 odds to land Irving – the fourth-best odds of any NBA team. Only the Knicks (4-1), Suns (9-2) and Celtics (13-2) have a better chance (at least per Vegas) of seeing Irving suit up for their team in game No. 1 next year. Translation: Denver is a real player in the Irving sweepstakes. Who and what they should be willing to give up has become a hot debate. One camp of Nuggets fans wants the team to go all in and offer the Cavs a monster package. Take anyone but Jokic and Millsap, they say. This camp is fine parting with both Jamal Murray and Gary Harris if it means landing Irving. Of course, it’d take Wilson Chandler and a pick or two as well, but, fear not, Irving is that good and worth the hefty price tag. Another camp is open to the idea, but only at the “right price” – AKA an unrealistic price. Cleveland isn’t going to part with Irving for a package of Emmanuel Mudiay, Kenneth Faried and draft picks. The salaries match up, but the talent does not. Cavaliers owner Dan Gilbert might write in Comic Sans, but he’s not dumb. Finally, a third camp is approaching the situation a little more rationally. Yes, it would be agonizing to see Murray or Harris depart, but the deal makes sense if Denver could keep one of the two and still land Irving. After all, Irving has been to four All-Star Games and hit the game-winning shot in Game 7 of an NBA Finals. You don’t receive an asset like that without a difficult goodbye. If Cleveland knows they have to move the disgruntled Irving, expect a trade to be made sooner rather than later. Connelly and Nuggets president and governor Josh Kroenke must decide quickly which camp they’re in. The thought of giving up both Murray and Harris is painful to comprehend. The Nuggets have preached patience for so long – building around this young core – and that future we’ve dreamt of might finally be here. On the other side of the coin, a core of Irving, Millsap and Jokic should make any fan salivate. 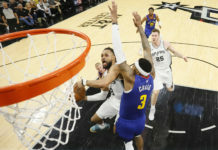 The NBA is all about having a “big three,” and that’s about as enticing of a big three as there is. 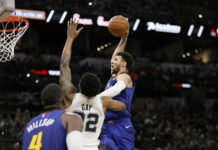 A point guard who can fill it up and dish the rock, a bruising big man who is a hard-nosed defender while putting up 20 and 10 and, finally, a unique center in the league who is a triple-double machine. But imagine having those three and either Murray or Harris to form a “big four,” if you will. At times, Murray looked like a baby Steph Curry in his rookie year and pairing him with Irving in the backcourt could make for one of the deadliest backcourts in the league. 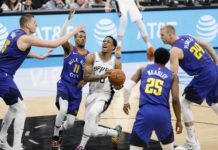 Meanwhile, if Harris is the guard retained, the Nuggets would keep their best defender and have a lockdown two-guard to consistently match up with the opponent’s best backcourt threat. For a team that struggled on the defensive end last year, it’d be difficult to justify trading the one guy who excelled in that category. Denver isn’t going to be able to keep both Murray and Harris if they want to land Irving. But they shouldn’t give up both, either. There’s nothing wrong with walking away from a deal if the price is too high. The Nuggets aren’t desperate; seeing this current roster on opening night would be a treat. Still, it’s Kyrie Freakin’ Irving we’re talking about. Parting with a ‘potential’ piece for a ‘proven’ piece is the right thing to do, no matter how hard it is to stomach the loss of a guy oozing with upside. To Kyrie or not to Kyrie? This fork in the road is the question; the answer could shape the Nuggets for another decade.